It may seem that every Saturday since the start of eternity that Lithuania’s been having their ultra-marathon National Final format. However if you turn up on Saturday for the final, you’ll miss all the drama. To understand how Lithuania’s process does work. Ben Robertson met up with Lithuanian Head of Delegation Andrius Giržadas. It’s seven o’clock on Semi Final night for the Lithuanian selection, and I’m sitting in an out of town generic pizza chain above a hypermarket on the outskirts of Vilnius. It’s Kaziukas day here in the city, the official welcoming of spring where seemingly half the country has descended to wander past stalls of rye bread and local honey that last for miles. I’m to meet Head of Delegation Andrius Giržadas. He suggested the location away from the hustle and bustle and we were practically the only people in the building. It all seems too calm, too quiet, too relaxed. With less than ninety minutes until the broadcast begins the Head of Programming for LRT has just ordered a coffee and is sitting down for a long chat about all things Eurovision. Usually it’s at this point on a Saturday show where I’m lucky to grab two minutes with producers who are behind the scenes frantically putting the last touches in place. But I’ve missed all the commotion. The actual show was pre-recorded on Tuesday night. Five days ago. All that happens now is to wander into the station control room, press play on the recording, and count in the televotes that come in from across the country. No stress, no drama. In my head this would make the production far easier. You could record tracks again and again to make the final version just perfect. You could schedule artists to come in for different times during the day to give cameramen and directors a break. You could even add in shots from three or four different camera angles and then overlap them (think here how Molly’s ‘Children of the Universe’ was cut from multiple performances. That’s not the case here. Despite being a pre-record, the contest happens each Tuesday night ‘as-live’ in a single take. It’s only if something goes wrong does anybody step in. “This year Aistė [Pilvelytė, one of the artists in the National Final] was in her first round singing in the show. She didn’t step in to the music. According to our rules we could not stop the playback. But because it was her tenth time in the competition with all the respect to her we allowed it to happen [to start the song over]. They might have been tempted to make a clean cut and ignore anything ever wasn’t perfect. Certainly I can imagine Aistė herself wanting that in that situation; however with over 100 people in the audience and reporting for the media, there was no point in hiding. Any ‘story’ was already there, and those journalists would have cried about cover-ups and favouritism if there wasn’t that transparency. What this means is that the Tuesday night show is exactly what is shown on the Saturday, plus the technical edits like recaps that can be added in later in the week. 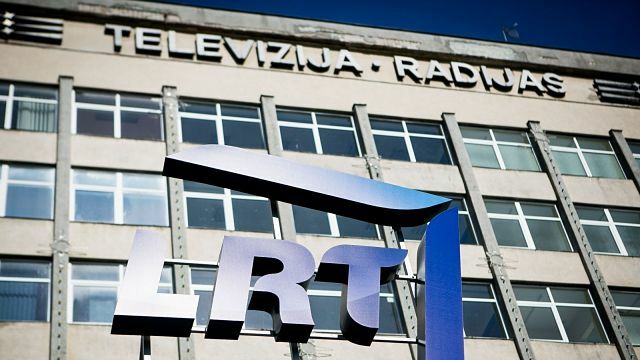 The only ‘live’ part of the show is the televoting, which are added to the jury votes and voiced over by just one individual at LRT headquarters. Like many small countries, Eurovision has far better credibility and opportunity here in Lithuania than many other countries around Europe. This means that it attracts artists to come back time and time again, even previous winners like last year’s entrant Donny Montell, who also represented Lithuania in 2012. However the music industry here is heavily localised with little chance to naturally escape beyond Lithuania’s borders. Andrius points out that big artists here could be have ‘no name’ even in neighbouring Latvia. This is another bizarre benefit to the pre-recorded show. The Lithuanian broadcast doesn’t have artists waiting nervously for results in the green room, hosts randomly jumping on them for interviews, and all the tension of the backstage area. Instead the artists are far away from the studio doing their own thing. Some maybe are watching at home and casting votes for themselves. However this is a Saturday night and for an artist that’s primetime territory for a gig of your own. Because the Lithuanian shows last throughout the winter, there’s no way the broadcaster can attract big name acts without using the pre-record. Those acts would simply miss out on so much paid work turning up at the studios each Saturday night their appearance in the National Final would directly make their career suffer. Money is also an issue here for the artist. Previous years of the Lithuanian selection have held a Gala Concert after the winner was announced. Viewers at home, instead of televoting, could donate money to the winning artist during this show. This year instead of a Gala Concert the televoting cost has been increased from 30 cents to 60 cents. From this amount 15 cents from each call will go towards a cash prize for the winning act. The point of this prize isn’t just as a reward for the winner – that is your budget to spend on your entry at the Eurovision Song Contest. So the next time you see a Lithuanian act arrive on the Eurovision stage with a shiny new suit, innovative props and pyrotechnics galore, remember that the money for that comes from the artist themselves. A small handful will be able to count on label help to bring a lavish, slick, and all too often Swedish show, but so much is the exception from the norm. One of the new features of Saturday night’s Lithuanian final is that it is being outsourced away from the TV studios for the first time. In what was explained as a ‘chance meeting’ between the Mayor of Klaipeda and LRT, the decision was made to host the Lithuanian final at the Baltic Sea port. This is not quite so random and follows on from Ventspils being a regular host of Latvia’s Dziesma competition until 2014. Klaipeda this year also acts as Lithuania’s Capital of Culture, providing the excuse and obviously the capital to make such a project possible. The money to run this certainly isn’t coming from ticket buyers for the 5,000 seater arena, with tickets sold for just three euros to cover the administrative costs. The popularity of the show surpassed all expectations with tickets selling out in minutes. Such a move has encouraged LRT that there is a commercial market for their shows as well. After hosting the European Basketball Championships in 2011 there are plenty of suitable arenas which would offer their interest. Whereas previously LRT would not take the risk of being left in the red, this year’s move has opened up that possibility. There are also the technical aspects to the show itself. One of the biggest challenges when the songs have so many different heats to go through is that it’s difficult to make the show feel fresh and interesting to the viewer. To do so LRT build up each performance in more layers as we go through week-by-week. Of course some of the artists are requesting this and wanting that from day one. It’s a relationship not dissimilar to Lithuania turning up in the host country asking for the full box of magic tricks to be opened. Sure, as Andrius confirms, there are many things that an artist can bring to help spice their performance and LRT will never ask where the money comes for these magic extras. But there is only a base level at the start that LRT can provide. The growth comes not just from extra flashy lights but also some pretty snazzy technology. The Semi Final was the first Lithuanian production using Cuepoint, a program which automates which cameras are being recorded when. This has meant some of the acts have been able to make sharper angle switches through different camera shots and reducing the risk of director error. The show was also broadcast in full surround sound for the first time. For the Grand Final there’s an extra toy at the disposal of the Lithuanian artists. A huge spidercam will be dangled from the roof of the Švyturio Arena, making it possible for long shots that steady zoom in on the artist as the camera flies towards them. While from the outside looking in it’s easy to dismiss the Lithuanian selection as a lukewarm repeating sequence of shows underneath there is a growth mentality to add extra layers and ideas to the basic package. The fact the Lithuanian selection does last for week after week after week has made the show one of the least anticipated in the Eurovision community. It’s also been a case for frustration from the Lithuanian artists, who as Andrius said, ‘started complaing that it’s a long show’. This year except for the final round no artist has had to do two shows back-to-back, adding variety and putting less pressure on the singers to return to the capital each week. Artists are listened to by the broadcaster who might try some out-of-the-box ideas. One that didn’t work was having artists switch competing songs during the show, which proved to be very unpopular. Other innovations have been a success though. For example songs can now be submitted with and without singers attached to them. This has resulted, predictably, in a flood of Swedish and British written songs being farmed out to the Baltics, but some of them have cultivated a final position on Saturday night. Andrius mentions Kotryna as an example of this, who transformed the demo given to her, breathing new life into the track so she could connect to it. This move was deemed essential to the ‘laziness’ of Lithuanian songwriters, who are less inclined to risk a first round defeat for no commercial gain when they can write songs that get local airplay anyway. So much seems strange seeing how many songs progress through many rounds of the competition, getting repeated Saturday night primetime viewing on the main station. And despite the drawn-out nature of the selection, each week it is the top ratings hit across all of Lithuania. ‘Eurovision is second only to basketball’ Andrius says with all seriousness. You can see why as a broadcaster Lithuania will want this long format. Ratings are high, artists enter without payment and they get to slowly try out new technology and learn new skills. Unlike many bigger countries, the staff working on the show have plenty of other projects throughout the year. The Song Contest format provides popular, simple programming for a small broadcaster that can barely dream of competing with richer, larger nations surrounding them. Why put pressure on yourself with difficult programming decisions when a competition provides all the excitement you need, and big names turn up for free? And they deliver each May too. Donny’s top ten placing last year meant he finished above the higher-tipped entries from Estonia and Latvia in the pre-contest rundown. Despite not winning yet, Lithuania has proven more successful in qualifying than their northerly neighbours with only five non-qualifications against Latvia’s seven failures and Estonia’s eight. Some of this could be attributed to strong diaspora voting, with Lithuania able to rely to televoting scores from Norway, Ireland and the United Kingdom, but the Lithuanian entries are generally safe, well-sung bops that squeeze past the semis. And so is their National Final format. While we as fans watching from abroad might tut at the lack of suspense and drama as the different songs get presented days after recording, there’s a reason why this works. Sadly at the end of the day, most of this comes down to smart financial management by a relatively small broadcaster and the individual artists managing their careers. The expansions this year are triggering the right conversations that might make LRT dare to dream with their selection format. It might get a lot more exciting soon enough.